The opening skirmishes of Group D offered little indication as to who might ultimately clamber into the quarter-finals, Cameroon and Guinea will be both targeting decisive moves on Saturday evening. The Indomitable Lions will arguably play the role of favourites, nonetheless in enjoying the better of a 1-1 draw with Ivory Coast, Guinea have already outlined that they have little interest in merely making up the group D numbers. Seemingly galvanised by Ebola-related adversity, the Syli National will consider themselves unfortunate not to have obtained more substantial reward from that fixture, accounting that they led the ten man Elephants throughout the game’s mainstay only for Seydou Doumbia to steal an Ivoirian point. Had the influential Ibrahima Traore’s long range effort been an inch lower with the score at 1-0 rather than cannoning back off the bar, then Guinea would likely have been toasting a momentous victory. Cameroon who entered the tournament off the back of stories revolving around rejuvenation, didn’t quite paint an outfit completely reborn from a calamitous recent history – although, taking a positive slant, Volker Finke’s side did improve considerably in the second half of their stalemate with Mali. Brimming with pace and energy on the counter, Guinea will present Cameroon with an altogether differing threat to the largely physical assault that they were subject to by a robust Mali. Similarly, Guinea are likely to find Cameroon’s sturdy backline – led by the ever impressive Nicholas N’Koulou – a far firmer assignment than that presented by Ivory Coast’s creaking defence. In the draw with Cameroon, Bakary Sako proved a persistent thorn in the Indomitable Lions’ side. Guinea will hope that the rapid runs of their offensive armoury can enjoy comparable success. Alongside Traore and Mohamed Yattara, who both won admirers on Tuesday afternoon, Cameroon are also likely to encounter the relatively unknown threat of Seydouba Soumah. Having missed the draw with Ivory Coast via suspension, the Slovan Bratislava attacking midfielder is pushing for a recall. Only Burkina Faso’s Jonathan Pitroipa could better Soumah’s tally of five qualification strikes, though Guinea’s fluid offensive showing in their opening fixtures means a potentially headache inducing call for Michel Dussuyer. Cameroon are also boosted by the return of a pivotal figure in the form of skipper Stephen Mbia, who, like Soumah, was absent through suspension for his country’s opener. Having survived Finke’s post World Cup cull of experienced heads, Mbia has developed into a prominent component of a side lacking in major tournament nous. Whilst restoring Mbia represents a relatively uncomplicated equation – provided the Sevilla man’s troublesome knee holds up – whether Clinton N’Jie is reintroduced presents a more taxing issue. 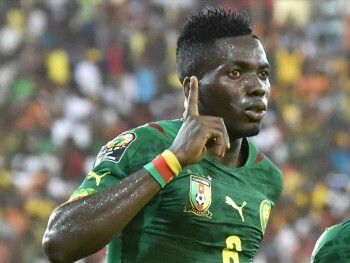 That the Lyon man was left out – despite his partnership alongside Vincent Aboubakar yielding seven of Cameroon’s nine qualification goals – raised plenty of eyebrows, although there are certain doubts over his fitness. In what will be the first AFCON meeting between the pair since the 1998 edition, victory for either would go a significant distance towards propelling them into the last eight. However, on the other side of that coin, defeat potentially could prove terminal. Questions hang over both in regards to their credentials to go deep into the tournament. Doubts linger in relation to whether Cameroon’s much-publicised renaissance is more than purely cosmetic, whilst there are uncertainties revolving around for just how long Guinea can keep disparaging the odds. These points of contention will become that little bit clearer on Saturday evening.